Below is a list of people we know or have met along the way who have helped us out. You can click on the logo to go to the site as well as read a little about them here. Destination Cycling (www.destinationcycling.com) is a Marblehead, MA-based bicycle touring company that specializes in European and custom cycling trips. Joe Tonon, the head of Destination Cycling, has long been involved in European cycling tours as well as giving back by way of charity bicycle rides. David E. Lanoue, Inc. (www.lanoueinc.com) is a Stockbridge, MA-based building and design company. David Lanoue has been a long time cycling supporter and is an avid cyclist himself. His company prides itself on aesthetically-pleasing, sustainable architecture and building methods to ensure that the world we cycle around continues to please. Berkshire Bike and Board (www.berkshirebikeandboard.com) is based in the Berkshires of Western Massachusetts, with locations in Great Barrington and Pittsfield. Steffen and Dave have helped us out a great deal and we are thankful to them for that. They strive to grow the cycling community with group rides during the week and excellent bicycle service. The Arcadian Shop (www.arcadian.com) is an outdoor specialty store in Lenox, MA. Ken Gonsalves, head mechanic and expert in all things bicycles and outdoor sports has spent loads of time with us dialing in our bikes and teaching us about outdoor equipment suitable for touring. Mention our name if you visit them! 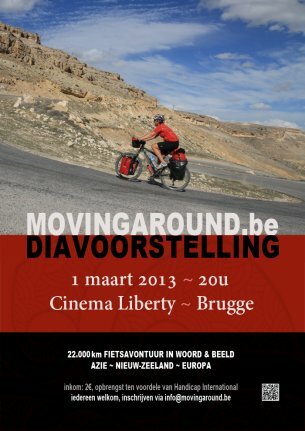 The Dutch Language page (www.movingaround.be) of Wim and Tine, a Belgian duo from Oostende, West Flanders. We had a great time hanging out with them in Leh, India, discussing our respective trips over the Manali – Leh Highway and planning more adventures. We´ll be sure to visit them again! The guys at Magic Mountain Adventures (www.magicmountainadventures.com) gave us food and shelter during a crazy dust storm-turned-rainstorm in Patseo, on the Manali-Leh Highway. We cris-crossed Raju´s group for the next week or so and we can tell you first hand that they are super, super nice guys and very professional. Even though we were doing our own ride, carrying our own stuff, they were very helpful and clearly love what they are doing. If we do the ride again, we´ll surely leave our bags home and take a grip with them! Pankaj and his guys (www.artofbicycletrips.com) were on pretty much the same daily schedule as us on the Manali-Leh Highway. Pankaj is very excited to bring more cycling trips to India, and even do road cycling trips! We spent a lot of time with these guys and they are great. Very open, friendly, smart and classy. We thank them for all of their advice and some great rides as we all tried to make it to Leh!